GDS held the second Consulting Technical Architects (CTA) drop-in workshop at our Whitechapel offices in September. The focus of the workshop was agile architecture. We chose this theme because architects across government said they wanted clarity and information about best practices. The main principles of agile architectures are that you should take an incremental and structured approach to design. Architects in agile teams play a crucial role in providing guidance and building the necessary infrastructure for teams to get projects started. Your team can jump into a project quickly, be flexible and focus on delivery when you skip the modelling stage. This is because you don’t go through a detailed planning phase. The disadvantage of skipping this stage, however, is that, your team may find that the architecture you start building does not scale. Having no overall strategy or plan for the future ahead can lead to a waste of resources. Workshop attendees agreed that you should only skip modelling in a project if you are prototyping or doing simple, single-use processes such as one-time data migration or file transformation. Lightweight modelling consists of lists and simple diagrams which illustrate a particular aspect of a system. You can use these sketches and lists to communicate concepts and get approval from stakeholders. You can also document decisions, peer review designs before building architecture and test ideas. Formal methods can help you to identify useful components and reuse them across projects. The downside of lightweight modelling is that some architects view this approach as a shortcut. Lightweight modelling can also cause lack of clarity and may result in poorly developed architecture. Heavyweight modelling tools are primarily database driven. They capture entities and relationships. These tools present views into the architecture from different perspectives, and encourage collaboration and reuse of architectural components and patterns. Heavyweight modelling requires a lot of work at the start of a project but usually results in well planned architecture. It can also help people build a thorough understanding of products. Teams are accountable for choices and you can use a common language and taxonomy. The downside of heavyweight modelling is that it’s inflexible, assumes perfect knowledge of user needs and requires a lot of resource. Our next CTA workshop is on 16 October where we’ll discuss mobile apps with architects from the NHS and the Home Office. The event will take place at The White Chapel Building in London. 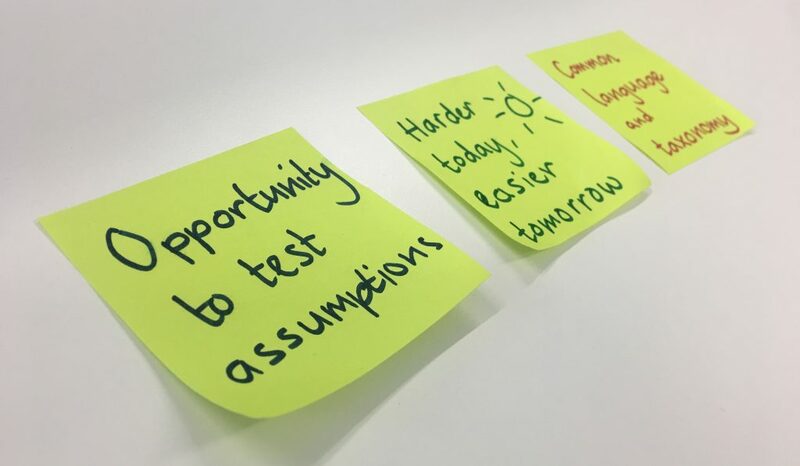 Get in touch with us at CTA-Mailbox@digital.cabinet-office.gov.uk if you’d like to attend, or would like to discuss agile architecture in your organisation.